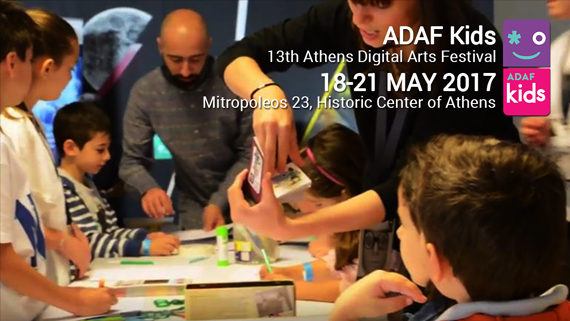 ADAF Kids returns strong for this year’s International Digital Arts Festival of Greece- Athens Digital Arts Festival (ADAF), which will take place from 18th till 21st of May 2017, in Mitropoleos 23, in the historic centre of Athens. The festival’s theme for this year is #PostFuture. Noise Toys | Instructor: Stelios Giannoulakis | Thursday 18/5, 10:00-12:00 a.m.
Paper Circuits | Instructors: Marianna Anthropelou, Alexandros Kalfoglou | Friday 19/5, 10:00 – 12:00 a.m., Sunday 21/5, 10:00 – 12:00 a.m.
3D Printing | Instructors: David Saltiel, Ilias Saltiel | Thursday 18/5, 10:00 – 11:30 a.m., Friday 19/5, 10:00 – 11:30 a.m.
Animating your image | Instructor: Ilias Chatzichristodoulou | Saturday 20/5, 13:00 – 14:00 , Sunday 21/5, 10:00 – 11:00 a.m.